The school year is well underway, and our first class of PTC students have spent the past few weeks becoming acquainted with their classes, professors, coaches, and the College. In case you missed it, we partnered with Year Up to launch Professional Training Corps (PTC) in Philadelphia, giving urban young adults the academic and professional skills, experience, and support that will empower them to reach their full potential. We thought we’d acquaint you with some of the Year Up faces that you’ll be seeing around the College, starting with Margaret Rizzo, Associate Director of Operations and People Development for Year Up. Margaret is part of the team who came to Peirce this summer to head up our partnership, and she will be keeping us updated on the goings-on of our PTC class on the blog. Here’s her introduction of our Year Up coaches. We’re very excited to have launched our PTC initiative here in Philadelphia in partnership with Peirce, and things have been off to a great start. A strong tenet of our training program is the coach support that our students receive. Each student is assigned a coach who stays with them while they’re in the PTC program. The coach encourages and supports them throughout the year, giving them the tools they need to succeed in PTC and their careers. We wanted to highlight the fantastic group of coaches we have here in Philadelphia. If you see them in the hallway, feel free to say hi! Daniel Holland is a native of Philadelphia, and the Associate Director of Corporate Sales and Partner Relations. He is charged with finding, developing, and maintaining relationships with corporate partners to provide internships for our students, as well as monitoring the progress of interns and partner satisfaction. Students will be able to turn to Dan for his insight into how to navigate and succeed in the corporate world. Nakia Mack is a native of Philadelphia and the Associate Director of Admissions and Program for Year Up. Prior to her position at Year Up, Nakia served as the Director of Pre-Collegiate Programs at Millersville University in Pennsylvania. Nakia also has an extensive background in higher education admissions. Nakia is a great resource for students who want to ensure that their academic pursuits are on mark with their career goals. 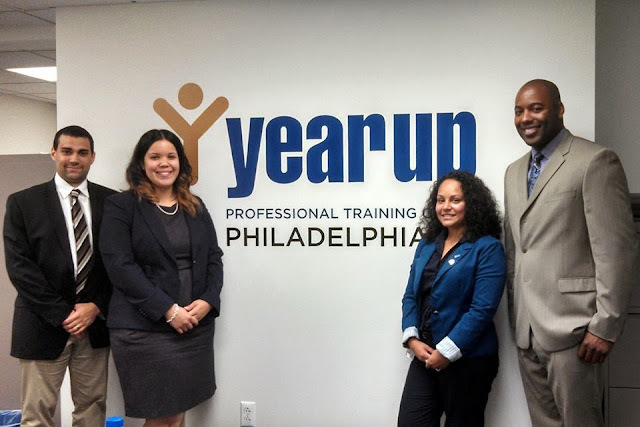 Stefanie Cuadrado, Program Manager, is a graduate of Year Up New York Class 2. During her time at Year Up, Stefanie interned at American Express with the Executive Solutions Team and was offered a full-time position as a Technical Assistant at the end of her internship. After working at American Express, Stefanie joined Year Up New York as an Internship Coordinator and later became a Site Leader. Stephanie can share her passion for Year Up’s mission and values with her first-hand experience of the program. She’s always there to help her students make full use of all the program’s benefits. Jameel Pugh, Program Manager, is a graduate of the University of Southern California’s Executive Master of Leadership program. He’s trained in crucial leadership competencies, including influence and motivational methods, team communication, conflict management, strategic analysis, and performance measurement. Jameel’s team-building experience goes beyond the professional arena – he was also a professional athlete. He’ll use these skills to help PTC students build their teaming and leadership skills. We’re excited to welcome all of these professionals to the Peirce College family. Keep checking the blog for more updates on our Year Up partnership.